Veronica and I reviewed The Wrath and The Dawn together not too long ago, but she is currently busy with life so it will just me today. Though you will probably hear from her in June regarding the book. 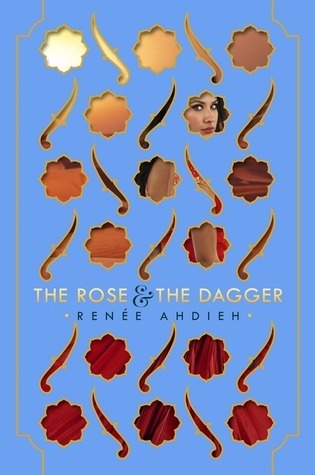 Renee Ahdieh’s The Rose and The Dagger is a wondrous follow up to The Wrath and The Dawn. It’s full of magic, mystery, and love. It reads like a complex piece of music, words flowing around each other, bringing together an epic love story. The novel starts right where the first left off. Shahrzad has left Khorasan to project her city, her people, her king. But she doesn’t know whom to trust or where to turn for help. She does know that the only thing to prevent this wrenched war is to break the curse. Khalid is love sick and tired, but ventures out to help rebuild his city. The relationships Shazi and Khalid have with others are strained and one wrong move could send them toppling over the edge. But if they can focus on their love for each other and the love for their families, they might find a way back to each other. I spent this entire novel with my heart clenched. The love that Khalid and Shahrzad share is one for the ages- an epic love story that will live forever. You can see it drive these characters and their choices. And it was admirable to see others who were so unaccepting of their love, come to terms with it. This novel was from mulitple POVs again, which always drives a story to make it stronger. I loved getting to know Irsa- Shahrzad‘s younger sister, seeing into the mind of Omar al-Sadiq- how he viewed his people, his wife, and his friends. The friends between the character’s were tested, while some broke, others held steadfast. And the twists throughout the novel were never seen until the curtain was drawn aside. I absolutely fell in love with this retelling, with Shazi and Khalid’s love, with their friendships. And while I wish there was more, I am satisfied with the way the story ended. Love this review. My heart was clenched the entire time I was reading too. I wish there was going to be a third book because I love the characters so much, but these two books were basically perfect. I want a movie too! Thanks! Yeah sequels are tricky and this far exceeded my expectations. I couldn’t put it down!